SRINAGAR: In his first visit after PDP-BJP coalition breakup and possibly the last one before the general elections are announced, Prime Minister, Narendra Modi spent a busy day in Jammu and Kashmir. The visit was yet another addition to his development story as he inaugurated projects and laid foundations projects valuing more than Rs 6000 crores. In a bid to play an emotional chord, Modi spoke a line each in the local language in Leh, Jammu and Srinagar. But the only perfect line he delivered was in Jammu. Unlike Leh and Jammu where he had some sort of local dress, this time he forgot wearing Pheran. He had stolen a Pheran moment in his first visit to Kashmir as Prime Minister. There were not many expectations from the visit because the general elections are around the corner but many optimists hoped against the hope that some CBMs might be around. But he followed the line his government has maintained throughout. CRPF men stand guard at a barricade in Lalchowk area of Srinagar on Sunday. In Kashmir context, Prime Minister Modi talked about militancy, peace, prosperity and the rural body elections. He complimented the state administration for holding the successful elections, peacefully and also getting the Jammu and Kashmir on the top list of various welfare schemes. Unlike his earlier visits, PM Modi sounded ‘harsh’ for dealing with the militancy and the ‘surgical strikes’ have explained the policy to the rest of the world. He paid his respects to the slain soldiers Nazir Ahmad Wani and Aurangzeb. He also appreciated the Panch and Sarpanchs for the recently held elections despite boycott and threats. While addressing his audience who were mostly from the power and IT departments, PM Modi was all praises for B V Subramanium, the chief secretary of the state. He also praised the present district commissioner, Dr Abid Rashid for his Swach Bharat award. After inaugurating the second phase of Rashtriya Uchchatar Shiksha Abhiyaan (RUSA), national high education mission, PM Modi proudly announced that he is connected to 2.5 crore students across India at a time and some of whom asked him various queries India but none of them included a student from any part of J&K State. Seemingly, Prime Minister Modi was addressing a larger constituency across India. He listed the initiatives of his government on various sectors. The governor Satya Pal Malik also addressed the audience, albeit briefly, indicating the three different weather conditions in three regions have not gone well with him. Apparently, he had caught a cold and was coughing. He even forgot the names of the dignitaries in the audience and was honest enough to say it. He also informed that his office has received at least 50,000 grievances and while talking about the recently held urban local bodies elections, he again appreciated that Srinagar got the foreign educated Mayor. He said the Panchs will be having access to Rs 70 lakh to 1.5 crores of funds for development. After this event, PM Modi was scheduled to meet Panchs and Sarpanchs in a separate hall, where no media was allowed. Reportedly a Panch from Budgam district had questioned PM Modi for the development of her district. But for the audience, it was a hectic day. The media corps was asked by the information department to report by 10 am and then they were taken to SKICC around 12.15 PM. The ground floor of the auditorium hall was fully packed and the ACs were put off as they were allegedly creating disturbance in the audio system. “We were literally packed like herds. It was so suffocating inside the auditorium that most of the guests were seen napping or yawning before PM Modi came inside the hall, who was running late by one hour. The event ended at 5.30 PM and since morning they kept us waiting without having food. The irony is the canteen was also closed,” said a journalist. For the reporters not even water was available. Prime Minister Narendra Modi laying the foundation and inaugurating several developmental projects at SKICC Srinagar. Meanwhile, the Kashmir was put under strict restrictions. 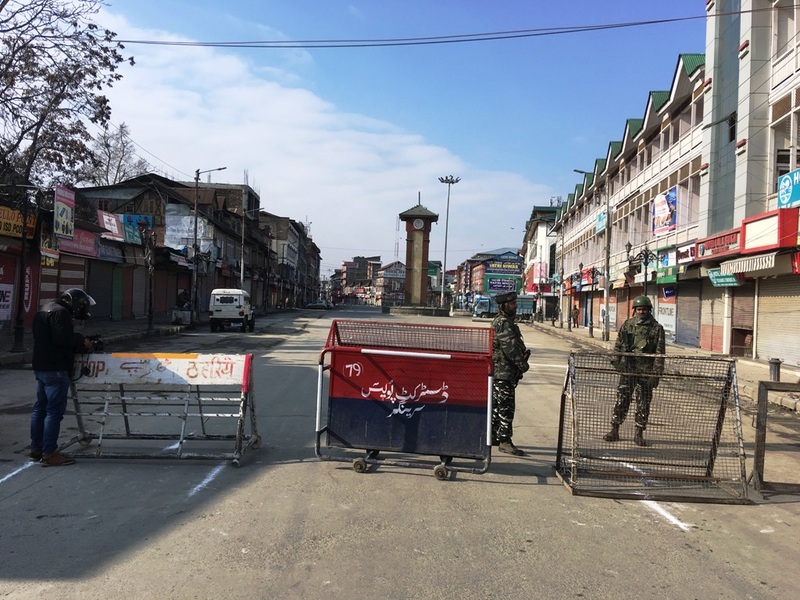 All roads leading to Lal Chowk were put under strict vigil with a lot of barricades. The mobile Internet also remained suspended throughout the day. While as the lawmaker Engineer Rasheed, who was lodged in police station Rajbagh was released late in the evening. The triumvirate of JRL, Syed Ali Geelani and Mirwaiz were put under house arrest and the JKLF chairman Muhammad Yasin Malik was lodged in the police station but late evening he was released by the police. There were not many political faces in the audience. While his MoS Dr Jitendra Singh and governor SP Malik accompanied the Prime Minister, his four advisors, chief secretary and other top officials were also part of the host team. But nobody turned up amongst the MPs and lawmakers, who were all invited, except PDP’s Firdous Tak and Zaffar Manhas and BJP’s Sunil Sharma.